For-profit colleges have been in the news quite a bit recently. As the name implies, these are educational institutions operated by private companies for the express purpose of earning a profit. Most private colleges and universities operate on a non-profit basis. And, as far as I know, so does every public educational institution. However, like most educational institutions, the students at most for-profit colleges are eligible for federal student loans, as well as educational financial assistance that’s made available to military veterans. However, because these colleges need to make a profit to stay in business, rather than relying on public funds, private donations, and endowments, many critics have raised concerns that they seriously compromise educational quality in the name of profits, and aggressively recruit students, regardless of the job prospects they’ll have when they graduate. 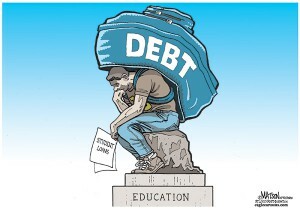 This can leave students saddled with tens of thousands of dollars in non-dischargeable (meaning it can’t be eliminated or restructured in bankruptcy) student loan debt, with job prospects that were no better than they were before they attended school. In some cases, this has led to lawsuits against the schools by former students. One of the biggest sectors of the for-profit educational industry is culinary school. Across the United States, there are a large number of for-profit culinary academies. Several culinary colleges, such as the California Culinary Academy, are being sued by former students, who are claiming that they were misled about their job prospects, and the reputation of the school. One of the most controversial practices engaged in by for-profit colleges is the way in which they recruit former military service members. Under the laws governing federal student loans, for-profit colleges are bound by the so-called “90-10 rule.” This means that at least 10% of the tuition they receive must come from sources other than federal student loans and grants, such as private loans, or from the student simply paying out-of-pocket, and the other 90% can come from federal loans and grants. If the college fails to meet this standard, its students become ineligible for federal student loans, which make up the vast majority of the college’s income. However, there’s a loophole in this law: educational funds given to members of the military in the form of the G.I. Bill count towards that 10%. So, for every former soldier they enroll with tuition paid for via the G.I. Bill, they can enroll 9 civilian students who can pay with student loans. This gives them a very strong incentive to heavily market to former soldiers, and get them to enroll regardless of their future job prospects, or even their ability to complete the coursework. For example, there have been cases where they signed up combat veterans who were still recovering from fairly severe brain injuries, as well as mental illnesses such as post-traumatic stress disorder. Some of these students couldn’t even remember what classes they were signed up for. But it appeared that the school didn’t care that they were getting nothing out of their “educational” experience, as long as their tuition checks (paid for by Uncle Sam) cleared. Not surprisingly, graduates of for-profit colleges tend to default on their student loans at higher rates than other colleges and universities. And because most student loans are paid for by the federal government, it’s the taxpayers who are ultimately on the hook for these loans. At least 35 percent of graduates are actively paying down their loans – lowering the total balance by at least one dollar per year. Graduates, on average, spend less than 30 percent of their discretionary income on paying down their student loans. Graduates, on average, are spending less than 12 percent of their total income paying down their loans. For-profit colleges would only have to meet one of these requirements to maintain eligibility for federal loans. A program that cannot meet any of them will lose this eligibility, effectively shutting it down. Federal officials estimate that, once these rules are implemented, about 5 percent of for-profit programs will be shut down. These requirements seem pretty reasonable, and any college that is unable to meet them probably shouldn’t be receiving federal funds. Most for-profit colleges are already responding to these rules by becoming more selective in their admissions (which should lead to smaller class sizes, and a student body that’s more qualified to be in college in the first place), and providing more accurate information about a graduate’s likely employment prospects, and information on avoiding excessive debt. Hopefully, these new rules will improve the overall quality of for-profit colleges, and the education they provide. Despite their problems, these institutions can fill a valuable niche in the educational market, especially since they largely focus on vocational training that more traditional universities often ignore. However, we shouldn’t allow them to engage in deceptive recruitment practices or saddle the vast majority of their graduates with debts that they cannot hope to pay off. While the gainful employment rule might be disruptive to some for-profit colleges, I think that, in the long run, it will improve the quality of the education they offer. At LegalMatch, we value our client’s opinion and make it a point to address their concerns. You can refer to our reviews page if you want to know what our clients have to say about us. Thanks for this informative post on for-profit institutions. Students saddled with debt can tend to plunge toward bankruptcy much faster, and these for-profit colleges must do their duty to educate so students can receive employment.